While for some people summer ends on Labor Day and for others summer ends on the first day of autumn; for me, summer ends with the annual closing of my pool--which I have just completed. Pool closing day marks, for me, the official beginning of the dark, cold seasons. I am being held hostage by the forces of cold and dark until April when I can reopen my pool and begin to enjoy summertime in earnest. The pool seemed to resist my efforts to close it this year and numerous small annoyances cropped up as I completed the now well practiced closing operation. But, sadly, I prevailed recognizing that the leaves are beginning to fall and the time was only growing shorter if I had decided to procrastinate and postpone the closing. For me there are only two seasons--summer and not-summer. Summer is marked by the opening and closing of my pool. Do I enjoy not-summer? Not really. I enjoy some things and some holidays, but they are really small points of light in an otherwise dismal season. 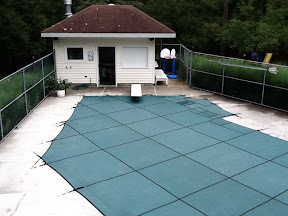 It is hard to believe that in a few short weeks we have transitioned from family gatherings around the pool, such as the one above--to the picture taken a few minutes ago of the covered pool, hibernating like a bear waiting for the renewal of the year. 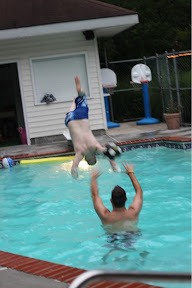 Soon, I will again hear the squeals of the grandsons chasing each other around the pool in heat of a nice summer day. And the non-summer season will be forgotten.